There are few Belgian beer styles that I haven't tried to brew. The Golden Strong Ale is one of those. It's a fairly basic style in terms of the ingredients. It's pilsner malt, sugar, Styrian Goldings hops, and Czech Saaz hops. The yeast should deliver fruity esters but not too many spicy phenols. 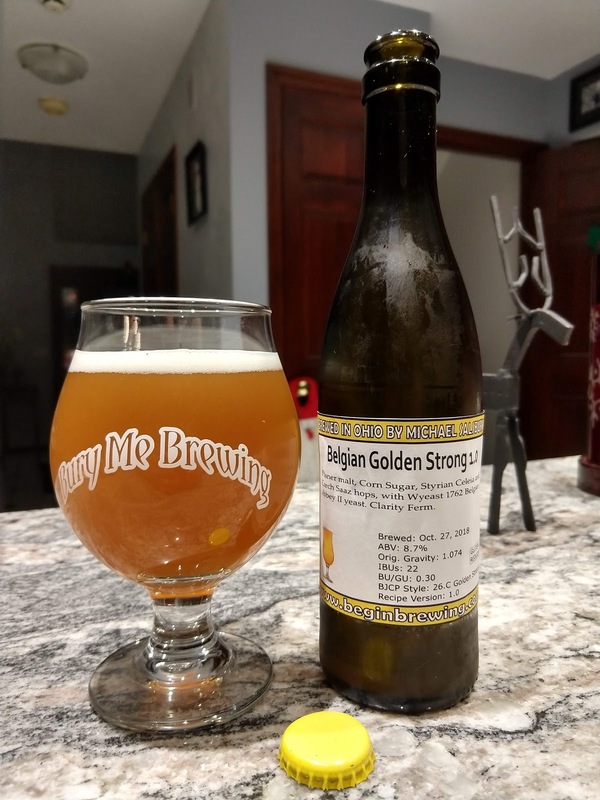 According to the Wyeast web site, Wyeast 1762 is one of the recommended strains for Belgian Golden Strong Ales. Their web site says that it's a relatively clean fermenter that produces dried fruit esters when fermented at higher temperatures or in a high-gravity wort. Wyeast 1388 is their recommended choice for the style, but 1762 is also recommended. Since I happened to have 1762 on-hand, I used it. When gravity reaches 1.025 SG or lower, raise temp to 75F and hold there until gravity stops dropping. Bottling will be with 5 carbonation drops per bottle (high carbonation). 10/27/2018: The Zymatic glitched a bit during the mash, with the temperature rising to 150F and then suddenly dropping down to 149F before bouncing back up to the 149F it was supposed to be. Whatever happened seemed to self-correct before I got to it to check on it. When I went down to check on it during mash out, I found a surprise. It had apparently overflowed the step filter, the drip tray, and leaked around the two plastic bins I'd put under the drip tray to catch any overflow. One of those plastic bins had about an inch of wort in it. The other had none. There was wort across part of the table top, dripping onto the floor, running across the basement floor, under a trash can and shelving unit, and puddled near the drain. Apparently quite a lot of wort had leaked while I was away from the machine. It even looked like some wort might have been dripping out of the machine itself. I spent quite a while mopping that mess up. Original gravity registered as 1.074 SG and the starting temperature was 74F. I drained most of the wort from a 1 liter starter, then swirled the rest and added it to the fermenter. I'm hoping there's enough live yeast to ferment the beer. We'll find out soon. If not, I have a fresh package I can use. 10/28/2018: The yeast appears to have grown in the starter (or been supplemented/replaced with wild yeast) as the gravity has been dropping steadily since about 3 hours after the yeast slurry was pitched. As of this writing, it's down to 1.052 SG from the initial 1.074 SG. That's roughly 30% attenuation and 2.9% ABV in under 24 hours. 10/29/2018: The gravity is now down to 1.033 SG and continues to decline. That's roughly 53% attenuation and 5.1% ABV in about 48 hours. 10/30/2018: The gravity is down to 1.016 SG. I raised the temp to 76F to get it to finish out fully. 10/31/2018: The gravity has dropped to 1.012 SG today, and the temp is down to 73F. That's 82.2% attenuation and 7.9% ABV. 11/1/2018: The gravity is down to 1.010 SG. That's 86.3% attenuation and 8.3% ABV. It looks like the gravity may finally be bottoming out. 11/3/2018: Gravity is down to 1.008 SG, which represents 89% attenuation and 8.5% ABV. 11/4/2018: Since I have it on-hand and have never used it, I decided to add Biofine Clear to this batch to see if it will drop nice and bright for me. I added a teaspoon to start, and may add more if needed later. 11/08/2018: I moved the fermenter into my mini-fridge to cold-crash and clear up. 11/14/2018: The fermenter was removed from the mini fridge and the beer bottled using five small carbonation tablets per bottle (high carbonation). The bottles were moved to my 76F hot box to carbonate. 12/13/2018: Tonight, I chilled and poured a bottle of the beer, as seen in the photo at the top of the post. Here are my tasting notes, in an approximation of BJCP scoring format. Aroma (7/12): Mix of fruity, caramel, and hoppy notes. Lacks the peppery and perfumy notes typical of the style. Appearance (1/3): Gold color with spotty lacing. Head isn't very long-lasting and not as effervescent as it could be. Cloudy rather than clear, which the style calls for. Gelatin finings might fix that. Flavor (14/20): Fruity and citrusy with a clear hop bitterness. Warming alcohol presence that gives it a peppery note. Mouthfeel (3/5): Medium bodied, a touch creamy. Not as effervescent as the style normally should be. Alcohol warmth is present but not intense. 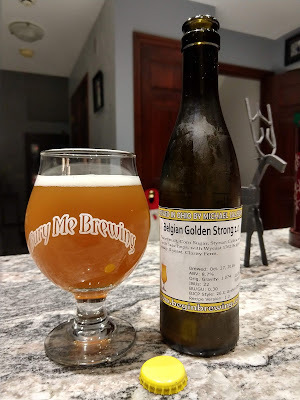 Overall Impression (6/10): The lower carbonation, lack of clarity, and a hint of diacetyl take away from what is otherwise a good Belgian Golden Strong. Needs a bit more peppery notes i the aroma and maybe a perfumy yeast or hop. That said, the flavor is pretty good otherwise. It's a bit sweet, fruity, slightly hop-forward, with warming alcohol notes. Increase the amount of corn sugar to lighten the body a little and reduce the sweetness some. Switch to a different yeast to see if we can get the perfumy and fruity aroma notes right. Increase the priming sugar to improve the carbonation. Add in some Carapils to improve head retention, and maybe a touch of melanoidin. One of my themes in 2018 has been to brew some new styles of beer. My approach is to read the available information in the BJCP guidelines, online forums, magazines, and anywhere else I can find it. I'll study the recipes to look for common themes and ratios, try to imagine how those recipes might taste as finished beers, and then come up with my own recipe based on what I've read. The British Old Ale style is one that I've liked when I've found a rare example here in the USA. Since I have never brewed one, today seemed to be the right time to try. My goal here is to create a darker-colored, higher-gravity Old Ale that's balanced (between malt and hops) and complex enough to make you want to sip it thoughtfully. The wort will then be pumped through a counter-flow chiller into a fermenter and cooled further to a yeast-safe temperature before the yeast and Clarity Ferm are added. The Lallemand ESB yeast likes to be between 65F and 72F. I'm planning to hold it at 68F until it's attenuated at least 60% of the sugar away, and then will raise it to 72F to finish out. I'm expecting this could take two weeks given the relatively high gravity of the brew. I'll then bottle it with a low or medium carbonation level and allow it to age a bit before serving. 10/21/2018: During the boil, the keg post between the Zymatic and the keg became clogged, slowing the flow of wort back into the keg during the boil and almost completely stopping it by the last three minutes of the boil. I came back to the machine to find the grain bed mostly full of wort. I drained the machine and pumped the wort into the fermenter, disappointed to find that there was less than two gallons and a very low gravity. I'll have to re-brew this beer to know how this recipe might really turn out. I'll pitch yeast into this one anyway and see what we end up with. It's possible the back-up into the grain bed might have extracted tannins from the grain husks and given the beer a nasty tannin edge. It may have prevented the wort from flowing properly through the hop cages, resulting in over-bittering or under-bittering. Even if the bittering was right on target, the gravity of the beer came up 25 points low, so it could be way over-bittered for the original gravity. I won't really know until fermentation is over. 10/29/2018: Gravity is down to 1.014 SG and is starting to level off. That's about 78% attenuation and 7% ABV. 10/31/2018: Gravity is currently holding at 1.014-1.015 SG and the temperature is holding at 66F. 11/3/2018: Gravity has been holding at 1.014 SG for a while now. That appears to be its final gravity. Time to bottle it and give it time to condition. 11/4/2018: The beer was bottled today, using three small carbonation tablets per bottle. Yield was only 21 bottles. 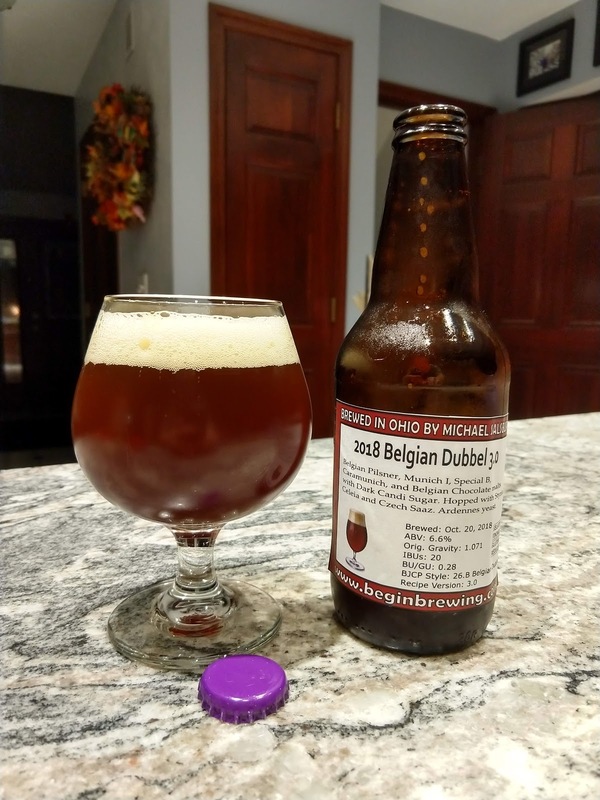 11/27/2018: The beer is about 3 weeks old now. When I opened the bottle, there was a solid hiss of released CO2 pressure. The beer poured a nearly opaque reddish brown with nice off-white head that lasted a while. The aroma hints at malt and licorice. The flavor is decidedly malty, with hints of prune or raisin, a clear but not too intense bitterness, a medium to full mouthfeel, and a bitter aftertaste. It's a good beer, but I wonder how much better it might have been if I'd hit my target gravities and had the ingredients on-hand that I'd wanted to use. I'll try the beer again in a few months to see how it has improved with age (if it has). I will also probably brew it again once I have the right ingredients. 04/16/2019: The beer did not fare well in the Barley's homebrew competition this year. In large part, this is because it became over-carbonated and foamed out of the bottle so much that there wasn't enough there to taste. One of the judges felt this was due to bacterial contamination. Given that my equipment is cleaned thoroughly after each use and sanitized before use. My bottles are rinsed with hot water, run through the dishwasher, and soaked in Star San before filling. While there are no guarantees, of course, infection seems unlikely. If it did happen, it most likely came from the internals of the Zymatic machine, which are sealed and impossible to fully clean. More likely would be over-priming or bottling too early. This particular batch spent about a week at 1.014 SG before bottling. Tonight, I opened a bottle to see if their experience was typical for the batch or a fluke. While I did not have a foam-over, there was definitely a LOT of carbonation... much more than there should be for the style. The beer is pretty dry, which makes me think it must have fermented more in the bottle. Honestly, I am probably going to toss this batch. It's bitter, dry, thin, and too carbonated. 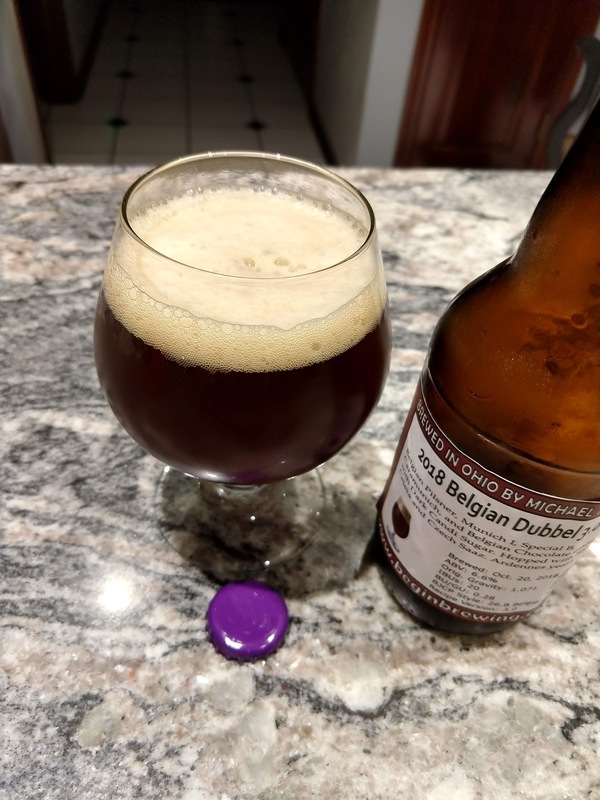 I've brewed plenty of Belgian-style Dubbels over the years, from a variety of recipe sources. None of them has ever really blown me away. If you've ever had a cellared bottle of Bornem's "Double" then you know what my ideal Belgian Dubbel is like. If I could brew something close to that, I'd be happy and have my "house" Dubbel recipe. My goal is a deep ruby color with a lingering whipped-creamy head. The aroma should suggest noble hops, a touch of caramel, and dark fruit. The flavor should be slightly sweet, a pilsner malt backbone with hints of chocolate and plenty of prune, raisin, and plum flavors. It should finish clean with no lingering cloying sweetness and no lingering hop bitterness. With these goals in mind, I've started from the ground up for this recipe. I'm using a base of Pilsner malt and Munich to provide some sweetness. To that, I'm adding Special B malt and Dark Candi Sugar rocks to provide the dark fruit flavors, Caramunich for some caramel, and Belgian Chocolate malt to darken it and add the chocolate notes. The Ardennes yeast strain will hopefully bring in some fruity and spicy notes. The Clarity Ferm is something I typically add to ensure that a friend of ours who is gluten-intolerant can enjoy the beers I brew. The wort will then be chilled to a yeast-safe temperature and the yeast pitched into it. The Ardennes yeast likes temperatures in the 65F to 76F range, but I've heard stories that it does well even up into the lower 80's. My plan is to let it free-rise and only to introduce cooling if the beer climbs into the 80F range. 10/20/2018: The brew finished 3 SG points higher than anticipated. It came out of the chiller at 82F, which was a bit high for the yeast, so I left it to cool a while before I was comfortable pitching the yeast. The yeast packages were a bit old and didn't seem to be swelling anyway, so waiting a while would give the yeast a chance to "wake up" if it was going to. I set aside some dry yeast to use if the liquid yeast didn't make it. I plan to give the yeast at least 24 hours to become active before pitching an alternative yeast. 11/1/2018: I bloomed a half-teaspoon of gelatin in distilled water, heated it to the 155-160F range, and treated the beer before cold-crashing it. 11/4/2018: I bottled the beer today, using 5 carbonation tablets (high carbonation) per bottle. Yield was 22 bottles. The bottles were placed in a 76F "hot box" to bottle condition. 11/27/2018: This is one of the better Dubbels I've brewed, but it's still not precisely what I want. I suspect that if I'd had the right yeast (I wanted Wyeast 1762) that would have helped. A couple of ounces of Melanoidin malt would have changed the consistency of the foam to what I wanted and maybe added more redness to the color. But I am still not quite hitting the dark fruit notes I want from the beer. I may try adding raisins to the next version. I've had several American-made Dubbels that weren't as good as this one, but I'm sure I can do better. At the BrewDog Annual General Mayhem (AGM) event in Columbus this year, I had the opportunity to meet the brewers from Scofflaw Brewing in Atlanta. I enjoyed all of their beers I tried, but one that stuck with me was their "Basement IPA", due to its sweetness and intense fruit flavors. The Scofflaw representatives said they brewed a sweet IPA because the market in Atlanta seemed to prefer it, as it was reminiscent of sweet tea. I reached out to ask if they'd share their recipe, but got no response. I decided to take a shot at cloning it myself, just for fun. From their web site, I knew that it contained 2-row Pale Malt, Acidulated Malt, and Carafoam Malt. It is hopped with Chinook and Citra hops. It's a 7.5% ABV beer with a reported 40 IBUs. Given that the bitterness in Basement isn't particularly intense or harsh, I suspect it's late-hopped more like a New England IPA than a traditional West Coast IPA. For that reason, I'm not starting my hops additions until the last 30 minutes of the boil. This should provide a smoother bitterness and intensify the fruit flavors from the hops. I'll mash for 90 minutes, half at 152F for fermentability and half at 156F for some residual sweetness (hopefully). I doubt it will be a perfect clone, but will serve more as a starting point for trying to dial in a better recipe. The wort will be pumped through a counterflow chiller and then cooled to 66F before yeast is pitched. I plan to let the beer free-ferment in a 68F basement, which is within the yeast's range. I plan to bottle it with 4 small carbonation drops (medium carbonation) per bottle and hold it at 70F until the beer is carbonated. 10/05/2018: It seems like there was too much water added again, as the mash compartment of the step filter was full to the lid. I'll need to reduce starting water next time around. There was a fair amount of foaming near the end of Dough In and during the mash, but no spilling outside the drip tray. As the Zymatic was heating the wort to boiling, it generated a Fatal Error #1 (heat loop inconsistency). After some diagnosis, I learned that the grain compartment overflow apparently clogged the duck valve and prevented the system from pulling wort out of the tray. I unclogged the valve and drained the tray, then removed the hops cages and cleaned the grain and remaining wort out of the tray. I then restarted the brew from the Mash Out step (although there was no grain in it). Next time I need to reduce the amount of starting water, perhaps to only 3-4 ounces more than the recipe software calculates. Volume was probably low. I didn't measure it, but I'm estimating 2 gallons. Original Gravity came out at 1.069 SG instead of the expected 1.074. Yeast was pitched once the wort cooled to 75F, which was around midnight. 10/06/2018: This morning, I noticed the gravity had already dropped to about 1.060 SG and the temperature had only dropped to 73F, which is near the upper end of the yeast's optimum range. I moved the entire fermenter into my mini-fridge for 2-3 hours to cool it back down into the lower end of the yeast's range to avoid stressing it and introducing off flavors. 10/07/2018: The temperature climbed to 74F overnight, so I moved the fermenter back into the mini-fridge to cool down. I removed it when the beer was at 66F and the gravity had dropped to 1.012 SG, which is lower than the expected final gravity. That puts the current ABV at 7.5% and the apparent attenuation at over than 81%. By midnight, the gravity was still holding at 1.012 SG and the temperature was holding at 69F. A taste of the beer from the fermenter showed a mild sweetness and strong hoppy fruit notes which reminded me of the actual Scofflaw beer. It will be interesting to see how this one turns out. 10/08/2018: The temperature is now up to 70F. Gravity is reading 1.009 SG today, well below the estimated 1.015 final gravity. 10/09/2018: The temperature is holding at 70F. Gravity has bounced back and forth between 1.008 SG and 1.009 for the last day or two. 10/13/2018: I bloomed and heated a teaspoon of gelatin in distilled water, added it to the fermenter, and placed the fermenter in the mini-fridge to cold crash. I'll bottle in a week or so when it's cleared up a bit. 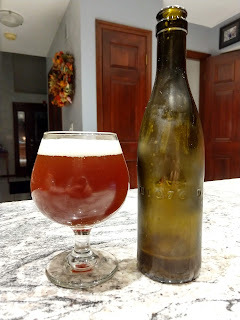 10/20/2018: The beer was bottled today, using four small carbonation drops per bottle (medium carbonation). Yield was 18 total bottles, owing to losses from the issues during brewing. Final gravity was reported as 1.007 SG by the Tilt Hydrometer.